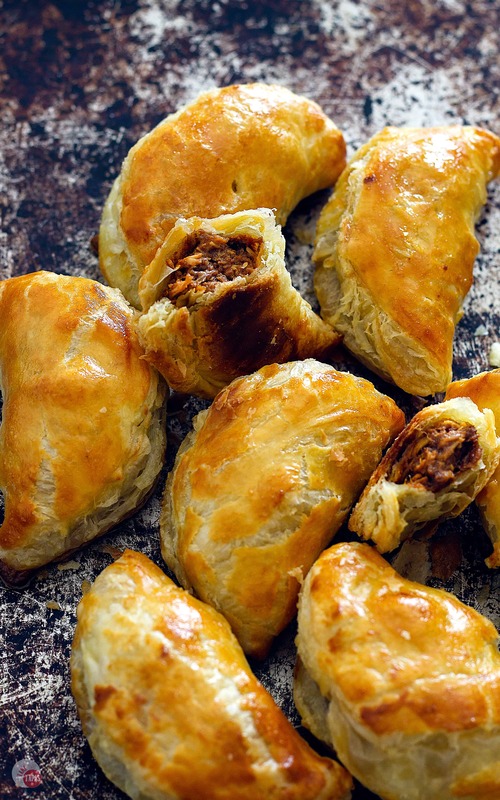 These dark chocolate mole empanadas are full of rich mole sauce and shredded chicken, baked in a fluffy puff pastry shell, and are the perfect appetizer or meal. This post sponsored by Forte Chocolates. The recipe and opinions expressed here are my own. Have you ever had Mole Sauce? If not, you are totally missing out! That amazingly complex sauce is great with chicken, beef, or shrimp. Here I show you how to make a quicker version that is just as tasty, and how to use it in these quick and tasty appetizers. 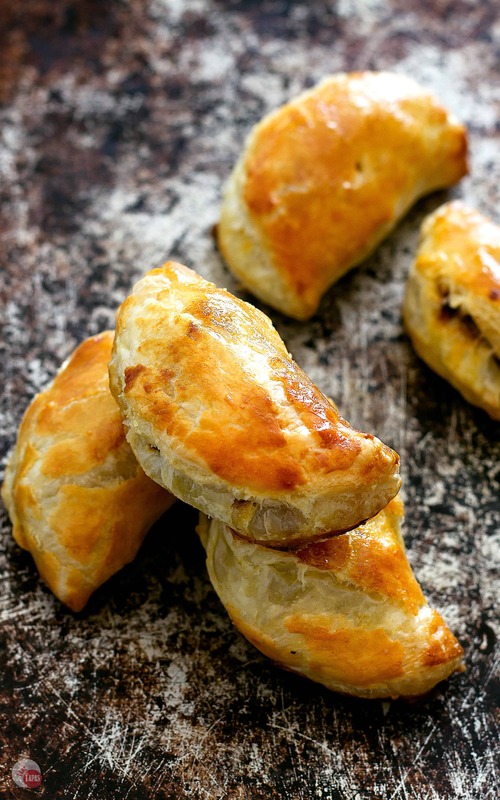 Now, these Dark Chocolate Mole Empanadas are meant to be a quick and easy appetizer that you can throw together with the help of puff pastry and pre-cooked chicken but the mole is the star! Just take me to the DARK CHOCOLATE MOLE EMPANADAS Recipe Already! If you’d rather skip my (very helpful, I think) tips and tricks, essential cooking info, and similar recipe ideas – and get straight to this delicious easy DARK CHOCOLATE MOLE EMPANADAS recipe – simply scroll to the bottom of the page where you can find the printable recipe card. What is Mole? It is a sauce of Mexican origin that usually takes hours to make with 20+ ingredients. Who has time for that? You can buy Mole in a jar in the Specialty foods aisle of your grocery store but why buy it when you can make it from scratch in less than 20 minutes? The Mole recipe makes 4 cups, but the empanadas only use 1.5 cups so you can save the extra in the freezer for a quick weeknight meal. Or make this mole now for use in the empanadas next weekend. My recipe for Mole starts with ancho chili peppers and a guajillo thrown in for a little spice. The Ancho chili peppers have a rich and chocolatey taste to them which makes them perfect for Mole sauce. Can you use chocolate in a savory recipe? If you think using chocolate in a spicy sauce is weird, don’t fret! I used to think the same thing but this is where chemistry comes into play. Chocolate actually enhances and brings out the flavors of spicy foods which is why I throw an ounce or two in my chili when I make it. The same thing happens with chili peppers to chocolate sweets. If you sprinkle a pinch of cayenne pepper in your brownies or chocolate cake, it will bring out the flavors of the chocolate and make it more intense. So don’t worry about putting chocolate in this savory sauce because it will all make sense once it hits your mouth. Another ingredient that seems weird is peanut butter. Some mole recipes use a lot of peanut butter, which I like but I don’t want it to taste like Pad Thai or peanut satay sauce. I just want to enhance the flavors of the chilies. Start with rehydrating your dried chilies in hot water. Then tossing them in a blender once you take the stems and seeds out. Toss in some baked or fried tortillas to thicken the sauce a bit. Saute onions and garlic are then added along with some chicken stock, that tiny bit of peanut butter, and some spices. Blend it until it’s a smooth consistency. Return it to the pan and let it simmer and the flavors meld. Once the Mole simmers, toss in the chocolate and let it go a little bit more. I chose this Forte Dark Chocolate for its rich flavor. It melts flawlessly and enhances the Mole perfectly! Forte Chocolate’s motto is “Celebrate Life Through Chocolate.” What can be better than celebrating life with family, friends, and great food made with chocolate? 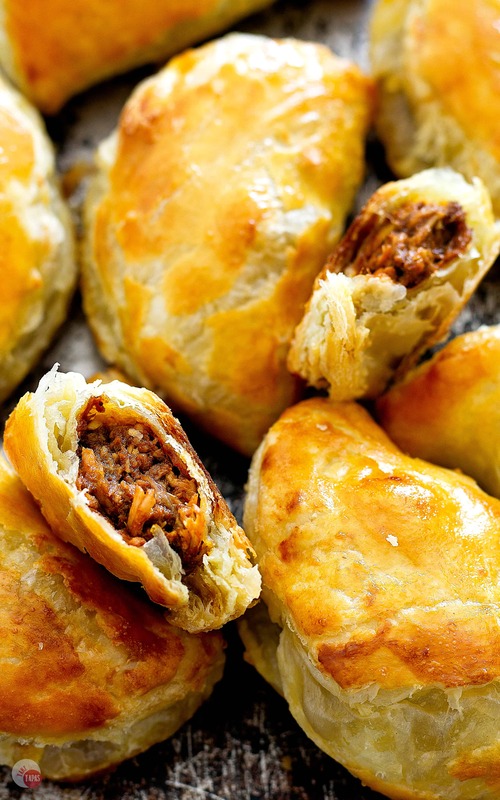 Now that you have your sauce, it’s time for the empanadas. Grab the puff pastry that you have in the fridge and unfold the sheets and cut each sheet into 6 squares or circles for prettier empanadas. Mix your Mole with some already cooked, shredded chicken. 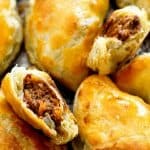 Place a tablespoon of the chicken mole mixture in the middle of the puff pastry circle. Fold over and crimp the edges shut. Brush with an egg wash and bake for 20 mins. Serve with a spicy jalapeño ranch dipping sauce! If you love this DARK CHOCOLATE MOLE EMPANADAS Recipe as much as I do, please write a five-star review in the comment section below (or on Pinterest with the “tried it” button – you can now add pictures into reviews, too! ), and be sure to help me share on facebook! In a microwave safe bowl place chiles and cover with water. Drain, remove stem and seeds and add to blender. Break tortillas into pieces and place in blender. In a large saucepan over medium-high meat add 2 tbsp olive oil. Add onion and a pinch of salt. Cook until soft, about 4 minutes. Add garlic and cook another 2 minutes, being careful not to burn the garlic. In a blender with tortillas and chiles add onion, garlic, peanut butter, chicken stock, cumin, and oregano. Return blended mix to a large saucepan and simmer for 10 minutes on medium high. Reduce heat and add chocolate. Allow to cool and store in the fridge for up to 1 week. 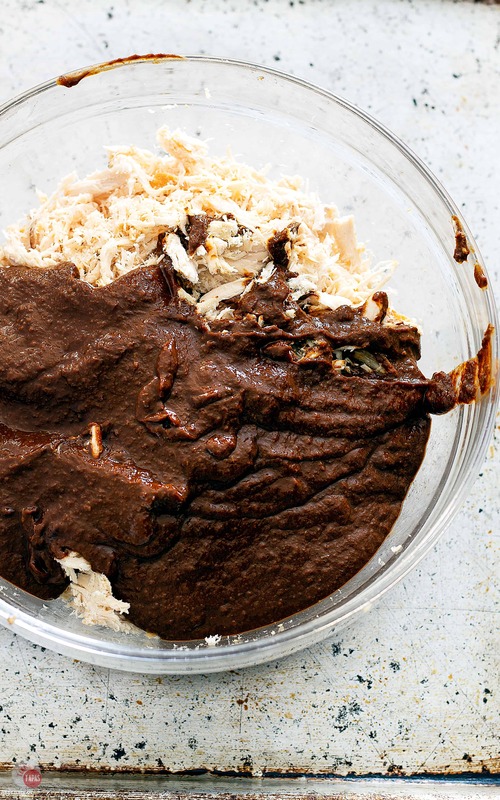 Mix your Mole with some already cooked, shredded chicken. 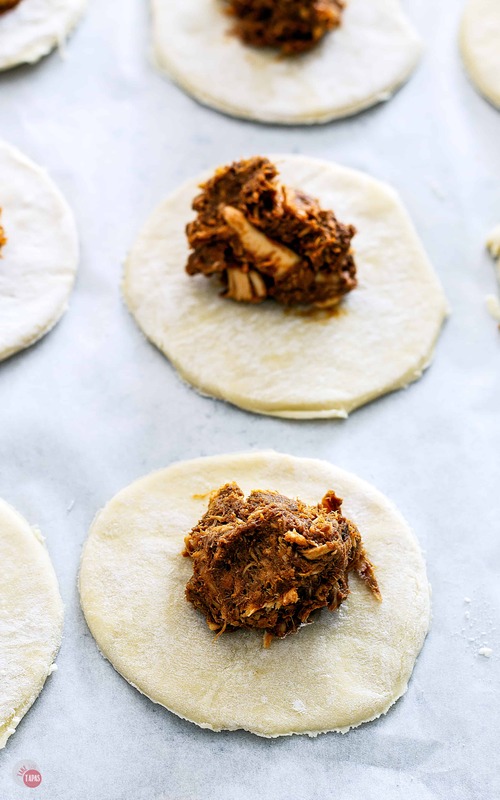 Place a tablespoon of the chicken mole mixture in the middle of the puff pastry circle. Fold over and crimp the edges shut. Brush with an egg wash and bake for 20 mins. 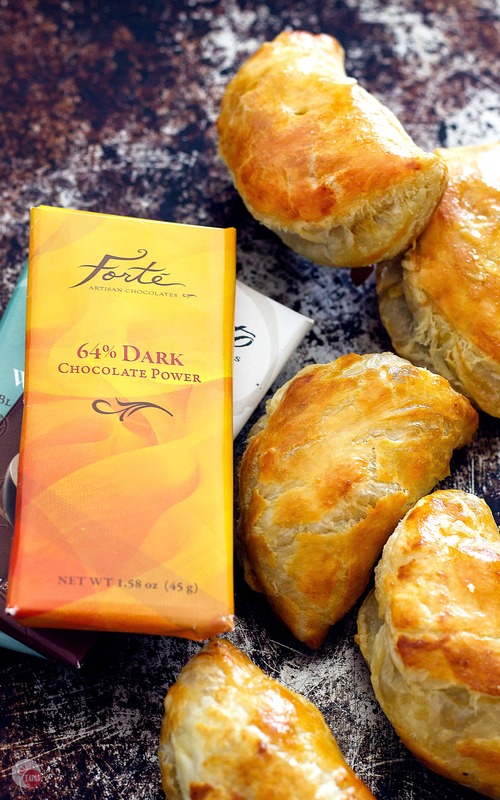 Visit Forte Chocolate on the social media channels for more flavors and recipe ideas! Their line of Gusto Bars is perfect for savory recipes! Check out all the other #Choctoberfest recipes posting today!